The Sun is merely one of countless stars in our Universe. It is a good example of a G-type main-sequence star (G2V, to be precise). And like all stars, it has a lifespan, characterized by a formation, main sequence, and eventual death.The Sun is considered a main-sequence star which means it is midway through its stable hydrogen burning phase. But when the Sun enters the red giant phase in around 5 billion years things are going to get a lot rougher in the solar system. The Sun has remained practically unchanged over the past four billion years or so, when the Earth and the solar system was born. Physicists believe it will stay the same way for another four billion years, at which point, it will have exhausted its supply of hydrogen fuel. All things must end. That is true for us, that is true for the Earth, and that is true for the Sun. It’s not going to happen anytime soon, but one day in the distant future, the Sun will run out of hydrogen fuel and slowly slouch towards death. This will begin in approximate 5.4 billion years, at which point the Sun will exit the main sequence of its lifespan. We need to remember, every second, 600 million tons of matter are converted into neutrinos, solar radiation, and roughly 4 x 10^27 Watts of energy. For the Sun, this process began about 4.57 billion years ago, and it has been generating energy this way every since. However, this process cannot last forever since there is a finite amount of hydrogen in the core of the Sun. As more hydrogen is converted into helium, the core shrinks, allowing the outer layers of the Sun to move closer to the center, resulting in a stronger gravitational force. When pressure on the core increases, there is resistance by a resulting increase in the rate at which fusion occurs. Basically, this means that as the Sun continues the proton-proton fusion chain reaction in its core speeds up and the output of the Sun increases. It is estimated that at present, this is leading to a 1% increase in luminosity every 100 million years. In all, there has been a total of 30% increase in the sun’s output over the course of the last 4.5 billion years. 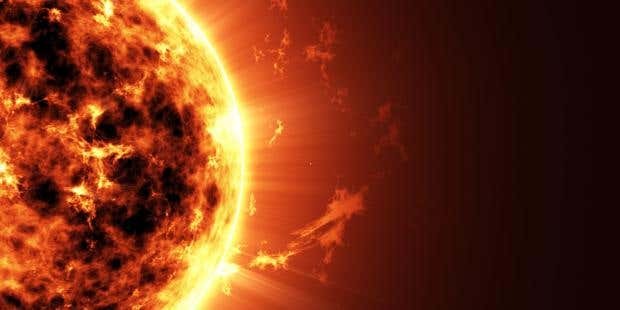 Consequently, in 1.1 billion years from now, the Sun will be 10% brighter than it is today, and this increase in luminosity will also mean an increase in heat energy, which Earth’s atmosphere will absorb. This will trigger a moist greenhouse effect here on Earth that is similar to the runaway warming that turned Venus into the weird environment we see there today. In 3.5 billion years from now, the Sun will be 40% brighter than it is right now. This increase will cause the oceans to boil, the ice caps to permanently melt, and all water vapor in the atmosphere to be lost to space. Under these conditions, life as we know it will be unable to survive anywhere on the surface. In short, planet Earth will come to be another hot, dry Venus. With its hydrogen exhausted in the core, the inert helium ash that has built up there will become unstable and collapse under its own weight. This will cause the core to heat up and get denser, causing the Sun to grow in size and enter the Red Giant phase of its evolution. It is calculated that the expanding Sun will grow large enough to encompass the orbit’s of Mercury, Venus, and maybe even Earth. Even if the Earth survives, the intense heat from the red sun will scorch our planet and make it completely impossible for life to survive. Once it reaches the Red-Giant stage, the Sun will have approximately 120 million years of active life left. But much will happen in this amount of time. First, the core – full of degenerate helium – will ignite violently in a helium flash – where approximately 6% of the core and 40% of the Sun’s mass will be converted into carbon within a matter of minutes. The Sun will then shrink to around 10 times its current size and 50 times its luminosity, with a temperature a little lower than what it is today. For the next 100 million years, it will continue to continue helium fusion in its core until it is exhausted. By this point, it will be in its Asymptotic-Giant stage, when it will begin expanding once again, much faster this time, and become more luminous. Over the course of the next 20 million years, the Sun would have become unstable and begin losing mass through a series of thermal pulses. These will occur every 100,000 years or so, becoming larger each time and increasing the Sun’s luminosity to 5,000 times its current brightness and its radius to over 1 AU – or equal to Earth’s orbit. At this point, the Sun’s expansion will either totally encompass the Earth, or leave it entirely inhospitable to life. Planets in the Outer Solar System are likely to change dramatically, as more energy is absorbed from the Sun, causing their water ices to sublimate – perhaps forming dense atmosphere and surface oceans. After 500,000 years or so, only half of the Sun’s current mass will remain and its outer envelope will begin to form a planetary nebula. The post Asymptotic-Giant evolution will be even faster, as the ejected mass becomes ionized to form a planetary nebula and the exposed core reaches 30,000 K. The final, naked core temperature will be over 100,000 K, after which the remnant will cool towards a white dwarf. The planetary nebula will disperse in about 10,000 years, but the white dwarf will survive for trillions of years before fading to black. When people think of stars dying, what typically comes to mind are massive supernovas and the creation of black holes. However, this will not be the case with our Sun, due to the simple fact that it is not nearly massive enough. While it might seem huge to us, but the Sun is a relatively low mass star compared to some of the enormous high mass stars out there in the Universe. If the Sun as a red giant sloughs off enough material before Earth evaporates, our planet will be revealed from its stellar cocoon in a Moon-less guise. Earth, robbed of its companion, would undertake a lonely vigil as the Sun turns eventually into a stellar corpse called a white dwarf, fading to black over the ensuing trillions of years. Alternatively, if the swelling Sun loses 20 percent of its mass prior to it reaching our vicinity, both Earth and Moon could be spared incineration and remain together facing each other for eternity. The actual outcome remains a theoretical uncertainty because no red giant star has been observed during this crucial phase.